Dazed and Confused. . 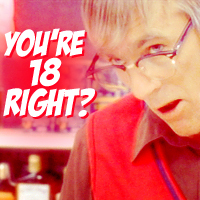 Images in the Dazed and Confused club tagged: dazed and confused icon 1993 david blackwell liquor store clerk. This Dazed and Confused icon might contain newsstand, duka la magazeti, tumbaku duka, tobacconist duka, tobacconist, duka la tumbaku, duka la duka la tumbaku, picha, headshot, and closeup.